Professor Henry Caswall, a professor, reverand and skeptic of Joseph Smith, visited Nauvoo on April 18 & 19, 1842. Caswell claims to have given Joseph Smith a very old Greek Psalter to examine and asked him what it was. (A Psalter is a volume containing the Book of Psalms and which often contains other devotional material. In the early Middle Ages Psalters were amongst the most popular types of manuscripts, rivaled only by the Gospel Books.) Caswell knew that Joseph was involved with translating other ancient documents, such as the Book of Mormon from Reformed Egyptian and the Book of Abraham from Egyptian papyri, therefore Caswall most likely wanted to see if he could trick Joseph with his ancient Greek manuscript. Professor Caswell reported that Joseph examined the ancient document and replied that it was a Dictionary of Ancient Egyptian Hieroglyphics. Caswall knew Joseph was wrong as this was a known Greek Psalter and definitely not Egyptian. Caswall says that he told this incident to Mormon apostle Dr. William Richards who said "Sometimes Mr. Smith speaks as mere man. If he gave a wrong opinion respecting the book, he spoke as a mere man." Called the "Anti-Mormon Extraordinaire," the Reverend Henry Caswall published The City of the Mormons, or Three Days at Nauvoo. He claimed that he gave Joseph Smith a copy of a Greek manuscript of the Psalms and that Smith identified it as a dictionary of Egyptian hieroglyphics. Caswall invented dialogue between himself and Smith to portray Joseph Smith as ignorant, uncouth, and deceptive." Encyclopedia of Mormonism, 1-4 vols., edited by Daniel H. Ludlow (New York: Macmillan, 1992), p.47. Cited in BYU Studies' LDS FAQ under "Anti-Mormon Publications." He told about the sport he had in fooling Joseph Smith and the people whom he met into believing that a Greek psalter he had with him was a new find, perhaps a lost scripture for the Prophet to decipher. He attributed to the Prophet the appearance of a knave and a clown, using exceedingly coarse language. In reporting his talk with Joseph Smith, he forgot that the Prophet and many other Church members had studied, Greek, Hebrew, and other languages, sufficiently to recognize Greek script. Such mistakes are often made by those who fail to tell the truth. Caswall's bitter opposition to Mormonism was revealed in the book he wrote a year later. What is at issue is Joseph Smith's ability as a translator, one of his roles or duties as claimed in D&C 124:125 "I give unto you my servant Joseph to be a presiding elder over all my church, to be a translator, a revelator, a seer, and prophet." It is asserted today that Joseph could translate with the use of a Urim and Thummim, a peepstone (or seerstone) and through direct revelatory means; he could do so unaided by physical media (such as plates or papyri). If Joseph was indeed a "translator," as God says he was, one would think he would also be an "identifier" as well—in other words, if he could translate ancient records, he should at the very least be able to identify the language of ancient records presented to him. There is an acknowledged problem regarding the translation of the Book of Abraham and associated papyri, and in his attempt regarding the Kinderhook Plates. The Greek Psalter incident may be another. The most notable translation is of course the Book of Mormon. As the angel took back the gold plates from which the BOM was translated, there really is little to look at to determine the accuracy of Joseph's translating ability of the BOM. However, since Joseph translated some other documents as well, it's prudent to examine whatever source documents that may exist for those translations. If it can be proved that Joseph translated other ancient documents correctly, when he would have no knowledge of how to do so, it would go a long way to help validate Joseph's ability as a seer and translator. Most LDS are of course familiar with the first three translations. And some LDS are somewhat familiar with the Kinderhook Plates but very, very few members are aware of Joseph's encounter with a Greek Psalter in 1842. Professor Henry Caswall, a professor and skeptic of Joseph Smith, visited Joseph on April 19, 1842. He gave Joseph Smith a very old Greek Psalter to examine and asked him what it was. (A Psalter is a volume containing the Book of Psalms and which often contains other devotional material.) In the early Middle Ages Psalters were amongst the most popular types of manuscripts, rivaled only by the Gospel Books. Joseph of course translated the Book of Mormon from Reformed Egyptian and he also translated the Book of Abraham from Egyptian papyri so he apparently knew Egyptian well enough to translate it and professor Caswall wanted to see what he thought about this ancient Greek manuscript. Joseph examined the ancient document and replied that it was a Dictionary of Ancient Egyptian Hieroglyphics. Professor Caswall of course knew Joseph was wrong as this was a known Greek Psalter and definitely not Egyptian. Professor Caswall then informed the Prophet that it was but a plain Greek Psalter. Joseph then left the scene. Professor Caswall told this incident to Mormon apostle Dr. William Richards who said "Sometimes Mr. Smith speaks as mere man. If he gave a wrong opinion respecting the book, he spoke as a mere man." Vol. I. Warsaw, Illinois, November 15, 1843. No. 45. THE MORMON PROPHET AND THE GREEK PSALTER. We lately heard a story, which while it may make us mourn over the depravity of Human Nature, serves to show, among many similar facts, the low artifices and cunning tricks, to which the Mormon Prophet will resort, in order to impose upon the gullibility of his followers. The story is in this wise; and can be substantiated by respectable witnesses. Some time since, Professor Caswell, late of Kemper College, near St. Louis, an Episcopal Clergyman of reputation, being about to leave this country for England, paid a visit to Smith and the Saints, in order that he might be better able to represent the imposture to the British people. It so happened that the Professor had in his possession a Greek Psalter, of great age -- one that had been in the family for several hundred years. This book, as a relic of antiquity, was a curiosity to any one -- but to some of the Saints, who happened to see it, it was a marvel and wonder. Supposing its origin to have been as ancient, at least, as the Prophet's Egyptian Mummy, and not knowing but the Professor had dug it from the bowels of the same sacred hill in Western New York whence sprung the holy Book of Mormon, they importuned him to allow 'brother Joseph' an opportunity of translating it! The Professor reluctantly assented to the proposal; and accompanied by a number of the anxious brethren, repaired to the residence of the Prophet. The remarkable book was handed him. Joe took it -- examined its old and worn leaves -- and turned over its musty pages. Expectation was now upon tip-toe. brethren looked at one another -- at the book -- then at the Prophet. It was a most interesting scene! Such is the manner in which this arrant knave imposes upon his followers! and such is the manner in which his knavery is sometimes exposed! Yet, strange that people continue to believe him! Professor Caswell, since his sojourn in England, has published a work entitled 'Three Days at Nauvoo,' in which this rich scene is represented in an engraving. He asked me if I had any idea of its meaning. I replied, that I believed it to be a Greek Psalter; but that I should like to hear his opinion. "No", he said; "it ain't Greek at all; except, perhaps, a few words. This book is very valuable. It is a dictionary of Egyptian hieroglyphics." Pointing to the capital letters at the commencement of each verse, he said: "Them figures is Egyptian hieroglyphics; and them which follows, is the interpretation of the hieroglyphics, written in the reformed Egyptian. Them characters is like the letters that was engraven on the golden plates." Caswall told this incident to Dr. Willard Richards, a Mormon apostle, to which the Mormon doctor said, "Sometimes Mr. Smith speaks as a prophet, and sometimes as a mere man. If he gave a wrong opinion respecting the book, he spoke as a mere man." I said, "Whether he spoke as a prophet or as a mere man, he has committed himself, for he has said what is not true. If he spoke as a prophet, therefore, he is a false prophet. If he spoke as a mere man, he cannot be trusted, for he spoke positively and like an oracle respecting that which he knew nothing." While it is true that we have only Caswall's view of this incident, it is consistent with Joseph's pattern of rather quickly determining the value and content of unknown documents that were presented to him. In order to test the scholarship of the prophet, I had further provided myself with an ancient Greek manuscript of the Psalter written upon parchment, and probably about six hundred years old. On the following morning (Monday, April 18th), I took my venerable Greek manuscript of the Psalter, and proceeded to the ferry to obtain a passage. Perceiving a respectable-looking store (or shop), I entered it, and began to converse with the storekeeper. I mentioned that I had been informed that Mr. Smith possessed some remarkable Egyptian curiosities, which I wished to see. I added that, if Mr. Smith could be induced to show me his treasures, I would show him in return a very wonderful book which had lately come into my possession. The storekeeper informed me that Mr. Smith was absent, having gone to Carthage that morning; but that he would return about nine o'clock in the evening. He promised to obtain for me admission to the curiosities, and begged to be permitted to see the wonderful book. I accordingly unfolded it from the many wrappers in which I had enveloped it, and, in the presence of the storekeeper and many astonished spectators, whom the rumour of the arrival of a strange book had collected, I produced to view its covers of worm-eaten oak, its discoloured parchments, and its mysterious characters. Surprise was depicted on the countenances of all present, and, after a long silence, one person wiser than his fellows, declared that he knew it to be a revelation from the Lord, and that probably it was one of the lost books of the Bible providentially recovered. Looking at me with a patronizing air, he assured me that I had brought it to the right place to get it interpreted, for that none on earth but the Lord's Prophet could explain it, or unfold its real antiquity and value. "Oh," I replied, "I am going to England next week, and doubtless I shall find some learned man in one of the universities who can expound it." To this he answered with a sneer, that the Lord had chosen the weak things of the world to confound the mighty; that he had made foolish the wisdom of this world; and that I ought to thank Providence for having brought me to Nauvoo, where the hidden things of darkness could be revealed by divine power. All expressed the utmost anxiety that I should remain in the city until the prophet's return. The storekeeper offered immediately to send an express eighteen miles to Carthage, to hasten the return of Joseph. At length I yielded to their importunities, and promised that if they would bring me over from Montrose on the following morning, I would exhibit the book to the prophet. It will be recollected by some, that a Mr. Caswell, professing to be an Episcopal minister, came to this city some twelve or eighteen months ago. He had with him an old manuscript, professing to be ignorant of its contents, and came to Joseph Smith, as he said, for the purpose of having it translated. Mr. Smith had a little conversation with him and treated him with civility, but as the gentleman seemed very much afraid of his document, he declined having any thing to do with it. Critc's comment: This October 1843 editorial confirms that Henry Caswall made a visit to Nauvoo and talked to Joseph Smith in 1842. The editors of this issue of the Times & Seasons were John Taylor and Wilford Woodruff. Of course, John Taylor is well known for his dishonest published denials concerning plural marriage—three times in 1844 as editor of the Times and Seasons and again in an 1850 pamphlet of a public debate he had in France—despite himself taking his first plural wife in December 1843, so he does not have much credibility; and the denial itself is vague and not terribly realistic in my view: Caswell was educated and articulate with no need to suffer any kind of intellectual inferiority among the frontier Mormons. The oh-so-common “speaking as a man” response from Richards gives Caswell's story a definite air of credibility. "We are accused here of polygamy,... and actions the most indelicate, obscene, and disgusting, such that none but a corrupt and depraved heart could have contrived. These things are too outrageous to admit of belief;... I shall content myself by reading our views of chastity and marriage, from a work published by us containing some of the articles of our Faith. 'Doctrine and Covenants,' page 330... Inasmuch as this Church of Jesus Christ has been reproached with the crime of fornication and polygamy, we declare that we believe that one man should have one wife, and one woman but one husband, except in the case of death,..."' (tract published by John Taylor in England, in 1850, page 8; published in "Orson Pratt's Works," 1851 edition). At the time of Taylor's declaration, he had at least six wives back in the USA. We regret that we could not find this issue discussed on the Church's official website. However, we found several responses from LDS apologists and LDS leaders which we cite below. Caswall wrote that when he challenged Latter-day Saint apostle Willard Richards with Smith's mistaken identification, Richards responded that "sometimes Mr. Smith speaks as a prophet, and sometimes as a mere man." Knowing that Smith had a great interest in languages and studied them when he could, Richards understood this, but Caswall failed to grasp the distinction. Apparently Palmer struggles with the distinction as well. He takes the episode as evidence against Joseph's ability to translate anything. Note: FARMS has their usual disclaimer which they customarily have on virtually every article published on their website: "The views expressed in this article are the views of the author and do not represent the position of the Maxwell Institute, Brigham Young University, or The Church of Jesus Christ of Latter-day Saints." Editor Comment: According to an article published on the website of the most official, pro-LDS organization there is, they don't seem to question that the Greek Psalter incident took place as described. However they support apostle Richard's assertion that Joseph was just speaking as a man and that Joseph only gave his scholarly opinion to Caswall thus not really harming Joseph's credibility as a prophet, seer and translator. We support professor Caswall's response to Joseph's error: "Whether he spoke as a prophet or as a mere man, he has committed himself, for he has said what is not true. If he spoke as a prophet, therefore, he is a false prophet. If he spoke as a mere man, he cannot be trusted, for he spoke positively and like an oracle respecting that which he knew nothing." When Joseph speaks and leads others to assume he is speaking as a prophet then he needs to be accountable for what he says. It's very convenient to say Joseph speaks as a man whenever he's proved wrong and as a prophet whenever his statements can't be proven right or wrong or haven't been proven one way or the other yet. Joseph Smith did the exact same thing with the Greek Psalter that he did with the Book of Abraham papyri and the Kinderhook Plates. He saw an ancient document, one that he assumed no one in the world could translate and he said that he could translate it and he said what it was. And he was just as wrong with the Greek Psalter as he was with the Book of Abraham papyri and the Kinderhook plates. We could only wonder what Joseph would have done if professor Caswall would have given this document to Joseph saying instead that he thought it was an ancient religious document as opposed to a Greek Psalter. Would Joseph have come up with additional scripture that would also have some bizarre explanation like the Book of Abraham or the Kinderhook Plates? Did this event even happen? Grant Palmer's admission that we only have professor Caswall's view of the event. Professor Caswall was a Reverend and critic of the Church and was looking to find information to disprove Mormonism and its founder. Professor Caswall's account as shown. As a church we put a lot of stock in the testimony of others so why dismiss someone else's testimony of events so easily merely because it is critical of the church. As pointed out by Grant Palmer, it is consistent with Joseph's pattern of rather quickly determining the value and content of unknown documents that were presented to him. The newspaper account published the following year. The book published by Caswall called Three Days in Nauvoo. The artist's depiction of the event published in Three Days in Nauvoo. The articles or accounts of the event were never disputed by apostle Dr. Willard Richards or Joseph Smith after the event was published. Surely if Caswall never even talked to Richards, the apostle would have disputed it. And if Caswall did tell apostle Richards about the incident, surely the apostle would have mentioned it to Joseph and if the event never occurred Joseph would likely have refuted it but he never did. The Neal A. Maxwell Institute for Religious Scholarship, formerly known as the Foundation for Ancient Research and Mormon Studies (FARMS), which is located at Brigham Young University's campus and controlled by the LDS Church, is the largest, most respected pro-LDS apologist organization there is. Although their answers to church historical issues are not gospel doctrine, they are often cited in The Ensign and other church publications as highly respected and probable responses to troubling church issues. As mentioned above, the article on the FARMS' website does not question that the event took place but merely agree with apostle Richards about the significance of Joseph's analysis of the Greek Psalter. Our conclusion is that the event likely happened in some form as this seems like a lot of trouble for professor Caswall to go to e.g. publishing the story, getting a cartoonist to sketch the event, fabricating a follow-up discussion with an apostle about the incident, etc. Also, if even FARMS does not dispute the event took place then why should we? Professor Caswall likely exaggerated and perhaps embellished some details like Joseph's grammar to make Joseph seem even more ignorant, but based on the above it seems likely that the event probably happened pretty much as Caswall related. If this was the only translation issue that was damaging to the prophet then we would dismiss it as it wasn't really a translation even if Joseph was in error as to the identification of the document. 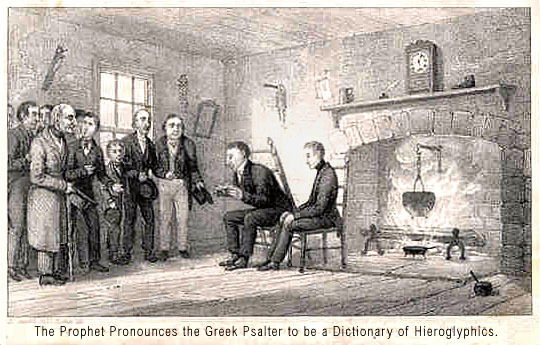 However, given the more substantial translation problems identified by critics with the Book of Abraham, Kinderhook Plates and the Joseph Smith translation of the Bible, the Greek Psalter incident needs to be scrutinized as well to look for any evidence that Joseph was really an accurate seer and translator. If Joseph really translated the Book of Mormon from reformed Egyptian characters and if he really translated the Book of Abraham from Egyptian papyri then he would know what Egyptian characters are and what they meant. Some defenders of the faith have said that some Greek characters are similar in appearance to some Egyptian Hieroglyphics. That may be true (we haven't studied this to validate this claim). However, since Joseph translated two whole books (over 500 pages) from reformed Egyptian and ancient Egyptian characters, he would have known that the Greek writings were not a Dictionary of Ancient Egyptian Hieroglyphics. His failure to recognize this casts doubt on his ability to translate ancient Egyptian or reformed Egyptian characters. Although the Greek Psalter incident is the translation effort with the least amount of significance, it further damages Joseph's claims to be a true seer. It's hard for many of us, that have analyzed the accounts of all of the ancient writings that Joseph claimed to have translated, to accept the fact that all of Joseph's translations, that can be proven as accurate, have all been proven to be incorrect. If nothing else, it was another opportunity for Joseph to prove himself to be a seer but he did not. There is a difference between an isolated incident and a pattern. The Greek Psalter, Book of Abraham, Kinderhook Plates, the Anthon Manuscript, and some would add the Book of Mormon (DNA evidence, anachronisms, lack of archaeological, anthropological, cultural, linguistic, and metallurgical evidence to support claims), reveal a disturbing pattern in Joseph Smith's methods and perhaps his character. The testimony of his mother about his ability to spontaneously make up stories about ancient inhabitants of the Americas and the story he told about Zelph the White Lamanite while on the Zion's Camp March to Missouri are consistent with this pattern. He seemed unable to resist the opportunity to appear as an expert whether he was qualified to offer expert analysis or not. This pattern of deception can also be seen in his tendency to use prevarication to cover up his polygamous activities. It raises serious questions in those who are fair-minded and objective about Joseph Smith's believability and credibility. An Insider's View of Mormon Origins, Grant Palmer, pages 34-36. Also, it looks like Hugh Nibley and David Whittaker did some research into the story. Here's the citation. Hugh Nibley, "The Greek Psalter Mystery or Mr. Caswall Meets the Press," in Tinkling Symbols and Sounding Brass, 11:304-406. Nibley probably argues the LDS apologist side better than anyone could.